HUP batteries last over 300% longer. HUP solar batteries last 2100 cycles of up to 80% discharge, while golf cart batteries and L16's only last for 500 cycles. Why? forget all the mumbo jumbo about various battery technologies, they're all the same essential chemical reaction that has been around for over a century. HUPs last longer because the plates inside are 5/16" thick. Each time a battery is cycled it errodes some of the plate away, so the thicker the plate, the more times you can cycle the battery. It's that simple! Compare HUP batteries to Trojan, Golf Cart, Marine, RV, and L16 batteries. HUP batteries cost 50% less long term. Because HUP Solar batteries last so much longer and require less maintenance, you'll save anywhere from 35% to more than 600% per kilowatt hour over the lifetime of your battery(ies)! Have a look at the cost savings of HUP hatteries over L16, Trojan, Marine, RV, and Golf Cart batteries in detail! HUP solar batteries save your back. Compact, upright orientation requires less bending to maintain. Furthermore, you'll replace your solar batteries every 20 years, instead of every 5. HUP solar batteries save space. 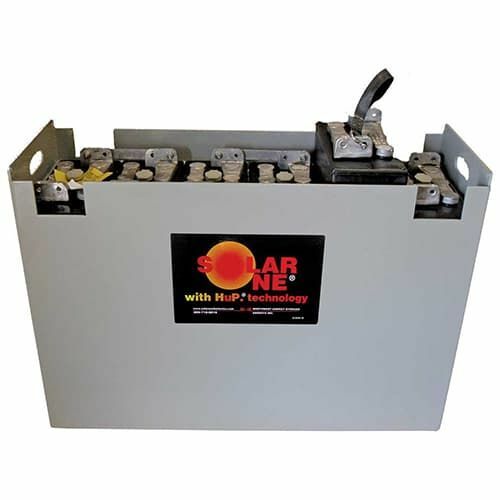 The compact, upright design of the HUP solar battery will reclaim floor space you previously lost to your L16 or golf cart deep-cycle battery array. This diagram illustrates that a typical golf cart battery bank uses nearly twice the amount of floor space as a comparable HUP array. HUP batteries are easier to install and move. While HUPs are one of the larger solar batteries on the market, the good news is they are designed to be easily disassembled and moved in smaller sections. Other Industrial size batteries have cells that are welded together, requiring them to be moved in 1000 pound blocks. Ugh! Not so with HUP! HUP batteries are less hassle to maintain. There are 48 cells for this typical golf cart battery bank compared with just 12 for a comparable HUP system. Plus, with HUP solar batteries, you only add water every 6 months, not every one to two months as you do with golf cart batteries and L16's. This adds up to being a huge time saver! HUP batteries are more efficient. Fewer series cable connections means less resistance, and less chance for corroded connections. Fewer parallel strings means the charge current is balanced, and that weaker cells are not pulling power from stronger ones. The system is also easier to wire and troubleshoot. HUP batteries are better for the environment. Batteries are not the most enviromentally friendly part of your off-grid solar-electric system. They contain hundreds of pounds of lead and sulfuric acid. The good news is that more than 97% of a battery can be recycled, and since HUP batteries can last more than 20 years, the energy required to ship them back and melt them down is 4 times less than with L16 and golf-cart batteries that only lasts for 5 years. HUP has the longest warranty in the business. HUPs carry a 10 year warranty, which includes the cost of a professional installer to travel and replace any battery cells that become defective in the first year! HUP Solar batteries come with free shipping inside the continental US! That's right! Order HUP Solar batteries and the cost of shipping and handling is on us! NOTE: This may or may not mean a delivery to your door. Free shipping means the battery will be shipped from the factory to the nearest business with a forklift (building supply, hardware store etc. ), or compatible truck terminal.